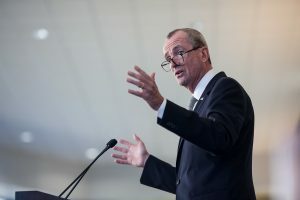 Teach NJS thanks Governor Phil Murphy for prioritizing the safety and security of all students in his budget, whether in public or non-public schools. At the same time, given the tragic incidents of gun violence in schools around the country, we would like to ensure that the security needs of all school children are properly supported by the State. We look forward to working with the Governor and Legislature to make sure that security at every New Jersey school is funded fairly. Over the coming months, Teach NJS also looks forward to working with Governor Murphy and the Legislature to ensure that the ever-growing needs of non-public school students; from security to technology, and nursing aid to textbooks, are met. About Teach NJS: Teach NJS, a non-partisan division of the Teach Advocacy Network, is supported by a collaboration of day schools, federations, synagogues, volunteers, communities and the Orthodox Union. It is coming off a year in which the state appropriated $40 million for certain nonpublic school funding areas, a 42 percent increase since the organization’s inception in 2015.